* For growing on small spaces & hard surfaces. Potato bins, spud grow bags and raised beds are used to grow prize winning potatoes for the garden show bench. They provide the earliest new potatoes. You can leave your potato bins or bags in a conservatory or cold greenhouse. They'll be growing before garden potatoes are planted outside. To find suitable potato bins, tubs and growing bags, potato growing compost, and fertilizer, follow these links. 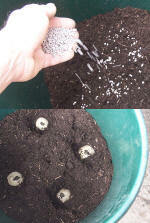 First I used large tough black polythene bags and rolled up the sides gradually as they were filled. I made a soil mix from garden compost and garden soil with added organic fertilizer - but don't underestimate the work of mixing your own soil / compost and filling the bags. 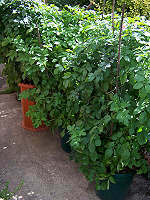 Nowadays organic potato growing compost is readily available for gardeners and much lighter than soil. Some gardeners reckon that plastic prevents sufficient air getting to the roots. Most potato grow bags are made of porous woven material and now I avoid using ordinary plastic sheet bags even if they claim to be potato bags. I avoid clay pots not least because they are heavy and fragile. But I don't find any problems using good light compost in these Giant sized potato buckets. They have drainage holes an inch or so from the bottom. They can also be used for growing other vegetables such as carrots, lettuce, and broccoli. Giant sized potato buckets are tough and long lasting. When I'm not using them they easily stack inside each other. The Airpot Potato Towers on this link have an advanced design similar to root trainers. They air prune roots of potato plants to increase root volume, nutrient uptake and crop yield. I don't advise making potato containers from car tyres as they are not easy to handle, occupy excessive ground space, a pool of water collects inside, and the hollow shape requires additional filling. They may add toxic compounds to the potato soil. of my 2009 potato barrel crop. My first specialised potato bin was the 80 Litre Potato Growing Barrel. It's made of a flexible corrugated material with stiff sides that fold flat when not in use. The sides pull up to give direct access to the potatoes growing near the bottom. It looks attractive on the patio but a little harder to move around. 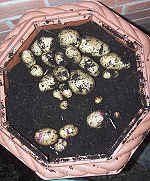 Suitable Containers For Growing Potatoes. 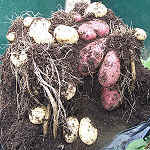 Organic Grown Potato Tubers, along with Potato Growing Kits and Grow Bags are on this link for you. You can also get raised bed kits, growing compost and fertilizer from the same supplier. 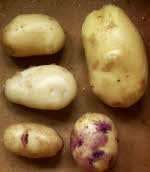 Click here to select potato varieties to grow at home. 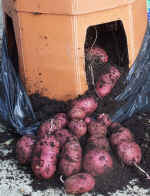 Potato bins, barrels & planters including the Giant Potato Tubs and more useful resources to help you enjoy home grown. Fill your potato bins or potato growing bags to about 4-5 inches deep with your compost. Now it's important to keep the compost in potato bins adequately watered, especially in dry spells - check them regularly (indeed every day). But for the smaller cropping early potatoes the flexibility of the potato bags, tubs and bins, is outstanding. Potato barrels & planters including the Giant Potato Tubs and more useful resources to help you enjoy home grown. There's more about growing potatoes on straw on this link. Coming later I'll write about my own straw bale potatoes.